Southbank Mosaics group, after William Blake, 2007-2014, in 'Blake's Lambeth', Carlisle Lane, Waterloo, London. Photo credit Kelise Franclemont. Speaking of art, unusual things, and out-of-the-way places, I found all three at once when tooling around on a bike and my route took me through Carlisle Lane behind Waterloo Station. A dark and musty cavern even in broad daylight, I nearly missed the 20 mosaic panels along the length of the tunnel, which I first took to be references to the Bible with all the depictions of angels, demons, and other suffering souls. That’s almost right; Carlisle Lane is one of three streets in the “Blake’s Lambeth” project from Southbank Mosaics, a non-profit and social enterprise devoted to public art and community service through the ancient art of mosaic. 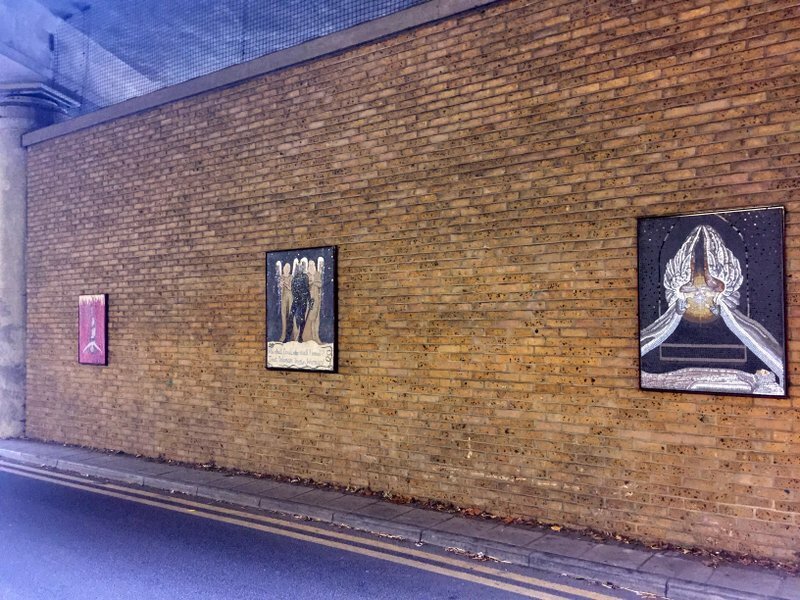 Southbank Mosaics group, after William Blake, 2007-2014, installation view, in ‘Blake’s Lambeth’, Carlisle Lane, Waterloo, London. Photo credit Kelise Franclemont. It was a pleasant Sunday afternoon bike ride, en route to Southbank Centre… and Citymapper took me straight into a gloomy tunnel around the backside of Waterloo. I hesitated, sure that my iPhone was conspiring yet again to nudge me down a blind alley, to be engulfed by wild graffiti and all manner of odd shadowy corners. Southbank Mosaics group, after William Blake, 2007-2014, in ‘Blake’s Lambeth’, Carlisle Lane, Waterloo, London. Photo credit Kelise Franclemont. Thankfully, like any decent art display, there was a plaque at the end of the tunnel to introduce “Blake’s Lambeth” a community project from a group called Southbank Mosaics, inspired by the life and works of poet-artist-printmaker William Blake (b. 1757, d. 1827). According to the plaque, Blake lived nearby on Hercules Street for a time, hence the connection; besides Carlisle Lane, there are two other such displays in this same area, Virgil Street and Centaur Street, making 70 mosaic works in all. For Southbank Mosaics, this historic art form is about community, sharing, and learning as much as it is about the simple pleasure of fine craftsmanship. This non-profit organisation based in St John’s Crypt (Waterloo) provides education and volunteering opportunities for artists, researchers, and hobbyists, as well as at-risk youth and other local community groups. Founded in 2004 by David Tootill, Southbank Mosaics has worked with individuals, organisations, and community projects to develop more than 300 installations all around London, including the regeneration at St. John’s Garden, Blake’s Lambeth (2008-2013) and Queenhithe Timeline Mosaic (2014). A number of smaller commissions include signage for Network Rail at Waterloo Station, paving at Southbank Centre, sculptures, memorials, and private clients.